Maybe the best thing about The Pretty One going to college is that he learned to eat spicy food. He’s much more fun to cook for now! I always cooked fairly bland food for the family because I had a child who didn’t explore foods and didn’t enjoy spice. Having been raised by parents in the food service industry he was used to eating in restaurants too often and choosing his meals from boring kids menus, as opposed to eating a variety of food served at home. Not a smart way to raise a gourmet, but nevertheless, that’s how it was. The Pretty One was an expert at ordering chicken fingers, cheeseburgers and baby back ribs. That all changed with a Mexican Meatloaf! One year he spent spring break in Tulsa with his roommate’s family. Being a guest at someone’s home means eating what they serve, so there was no way to avoid the spicy meatloaf, peppers and all. And there the love affair with “flavor that kicks me in the mouth” began! I was shocked one evening to hear that the meal I served needed more spice. Who was this child? I’d been wanting to try a Mexican Meatloaf. This recipe looked good and pretty easy, so the next time I wanted to send dinner home with The Pretty One, I surprised him with my version of a Mexican Meatloaf. The recipe calls for ground beef, but I used part ground beef and part ground pork. I think you could use any combination of ground meats that you want. If I was making it for myself, I’d probably use ground turkey. I think I’ll give it a bit more zip next time by using fresh jalapeno peppers instead of canned green chilies. Click for recipe. The Pretty One stopped by tonight to pick up a batch of chili. And some money, of course. 😉 It was the first chance I had to ask what he thought about the Mexican Meatloaf. Rave reviews! He loved it! He especially liked the picante sauce on top, and said he ate it all in 2 meals. Sheesh – a whole meatloaf in 2 meals? I guess he did like it! So like chili (his favorite) and the Chicken Alfredo & Rice Casserole, I’ll be adding this to the Mama Love rotation. Combine first 9 ingredients and place in lightly greased loaf pan. Bake at 375 for 40 minutes or until done. 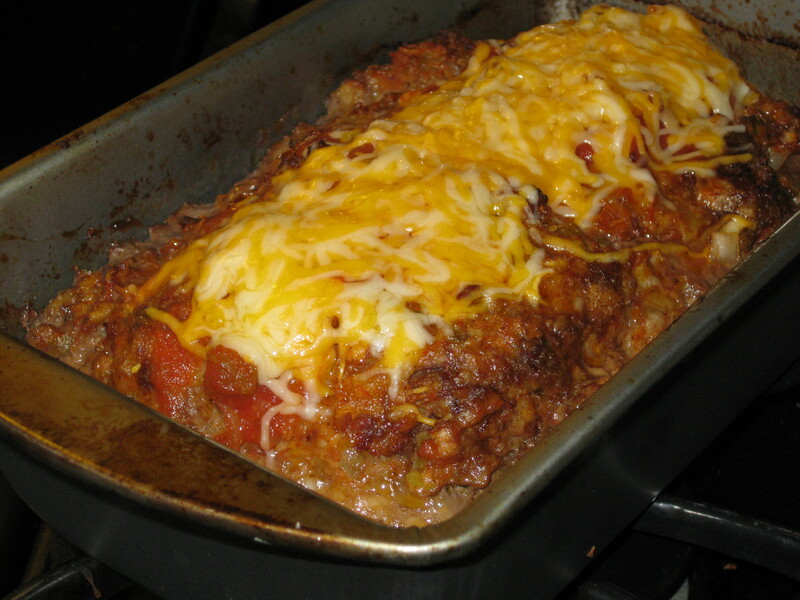 During last 10 minutes of baking, spoon desired amount of picante sauce over loaf and sprinkle with cheese. Bake until meatloaf is done. Garnish with sour cream, cilantro or picante sauce, if desired. « Chubby Hubby Bars…or Fat Boys?